That's what I intend to do. I'll just show up and everyone will have to love me. So much for discovering my talent. 1. I still don't know how to play anything on a guitar - acoustic, not, or hero. 4. I found out a handstand is very much out of the question, seeing as my thumbs are ready to fall off anyways from excessive golfing, and the unforeseen result of a handstand might be an entire arm doing just that, and julochka seems to think that a visit to the emergency room would not be cool. I personally think it would make for awesome tv, but if that stickam whatever thing (I have no idea) doesn't want to bend to julochka's will, I'm willing to forego the chance of waiting for hours to have someone glue my arm on. No handstand - suspicious or otherwise. 2. I only have two prepaid numbers at the moment, neither of which I know, so that's the end of memorizing mine. Also, memorizing a prepaid number is like preparing a fancy meal for a monkey, expecting an unforeheard comment on a specific literary issue from another kind of monkey, or learning the lambada in 2009. Pointless. 3. The best tequila the liquor store sells in Finland is Olmeca, which makes me want to throw down my sombrero in desperation and loot a tequila carrying post wagon. And then pretend to be the president of Mexico and draw up an angry complaint letter (referencing the queen of Denmark) to the government of Finland on the sad state of their state-owned (bad) bottle peddlers. 6. I forgot about the guacamole. There just might be some light at the end of the tunnel. Maybe. 13. My blog camp T-shirts are too small and will be forgotten home. Completely by accident. 728. I'll be finishing the Murakami Hermit Book Club book on the plane by reading every second line and underlining vigorously. But other than that, I'm getting kind of excited. And have presents. I do. 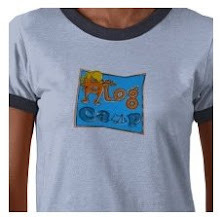 my blog camp t-shirts haven't come yet, despite getting a "they've been sent" notification. i hope they do. i ordered XL after hearing yours were small. :-( not cool, that, i'd never used zazzle before, so i had no idea what to expect. and i forgot all about murakami...we have to do that on friday evening! I won't be there but utterly expect to have my photo printed out (lamination optional) and set upright next to a glass of wine. Still no t-shirt here and like polly am fretting re presents. Have a couple of parcels to pick up but rather suspect that they will be dog related purchases. polly & seaside girl--do not worry about presents!! presents were mentioned only for fun, not to place undue pressure on anyone!! the fact that you bought tickets and dared to come to the home of a person you don't even know is present enough! but a bottle of hendrick's or beefeater crown jewel (in the purple bottle) from the LHR duty free wouldn't be amiss (i've already given B this assignment, but you can never have too much gin and i will gladly pay you back--i've even got pounds! ).